Recently, United States (US) President, Barack Obama, announced the deployment of 300 troops and surveillance drones to Cameroon as part of coordinated efforts to combat the seemingly intractable hostility of Boko Haram fundamentalism. An advance team of 90 troops has since arrived Yaounde, the Cameroonian capital. US engagement in Cameroon was re-echoed from Stuttgart, Germany, the powerhouse of US intervention force in Africa under the aegis of the United States AFRICOM project. Authorities at Kelley Barracks, Stuttgart-Moehringen, German military hub, are optimistic that the combined Cameroonian expedition would better enhance the capability and capacity of the Cameroon defense forces to promote stability and security within the country and the surrounding region. The drone centre in Cameroon adds to the growing number of US military deployments to Africa’s troubled spots. Already, there are twelve US surveillance base establishments in the continent, eight of which are in the Horn of Africa, including those in Djibouti, Ethiopia, Somalia, Kenya, and the Seychelles. Uganda also hosts US drones as part of efforts to counter the menace of the Lord’s Resistance Army. 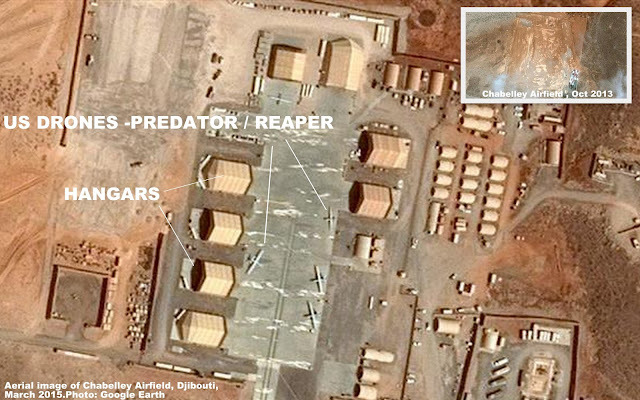 In addition, two US military facilities are stationed in the West African countries of Burkina Faso and Niger. In May 2014, the United States deployed 80 military personnel along with surveillance aircraft to Chad to track down Nigeria’s Chibok schoolgirls caged in captivity of Boko Haram militants. Genuine as the intentions were, that exercise did not achieve the desired objective, as the girls remain incommunicado till date. Twelve years of Boko Haram uprising has earned Nigeria the notoriety of a troubled nation. Nigeria was ranked fourth among the 10 deadliest countries of the world in 2014, as enumerated by PS21 “Project For The Study Of The 21st Century,” - a new global think tank for a new global era. This latest US initiative comes as African leaders, for months, have struggled unsuccessfully, to raise a Multinational Joint Task Force to tackle the insurgency that has claimed well over 50,000 lives in Nigeria, Cameroon, Niger and Chad since the rebellion escalated in Northeastern Nigeria in 2009. The deployment of the AU-backed task force is greatly hampered by logistic and financial difficulties disturbing the affected states. There is no doubt that US military intrusion is guided by America’s desire to defend and protect her strategic interests anywhere in the world, including but not limited to the growing Sino-African relationship, and an eye on African crude. It is also about US counter-terrorism pursuits, democracy and the rule of law. And the administration of President George W. Bush was explicit as to the reasons behind AFRICOM, which was designed initially for selected “friendly” African nations. Many African countries, including Nigeria, South Africa and Botswana, through the instrumentality of the African Union reacted nagatively when the programme took off in 2008. Their gruise was based purely on respect for the principles of the AU Charter adopted in Lome, Togo in 2000, which rejects outright, the establishment of foreign military bases on the African continent. But this is no longer tenable, and African leaders seem comfortable, unfortunately though. With as much as 13 locations in place, the US has obviously ran contrary to the AU Constitutive Act by dealing directly with individual countries on specific conflict situations, and establishing defence bases - an exercise concealed with wider implications for the continent than Washington could imagine. A critical assessment of the current US unilateral intervention, be it in Cameroon or elsewhere in Africa, depicts a delicate situation for African as well as for US interests. 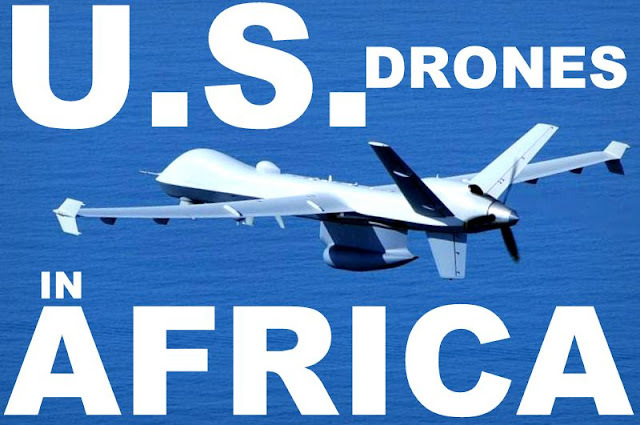 On the long run, US intervention, using the drones or operating directly under AFRICOM mechanism is becoming counterproductive as it continues to attract those negative elements hostile to American interests into Africa. And Africa is fast becoming a battlefield between the US and its adversaries. Needless to recall here, the Somalia syndrome that casts doubts on Washington’s real intentions, and suitability of her carrot gifts in the management of conflicts on the continent. There is a paradigm shift from internal and cross-border political conflicts that hitherto engulfed African countries to religiously motivated extremism, insurgency and terrorism, which has links with die-hard counterparts operating in Afghanistan, Syria and Middle East. And that is what is dangerously playing out in Africa’s four cardinal points. Boko Haram, for instance, has long been internationalized, and has graduated from a local anti-government movement to one that seeks to defend core Islamist values, picking on Africa as a line of least resistance, and carrying out nefarious activities to which neither Christians nor Muslims are spared. It claims strong attachment to Al-Qaeda, AQIM, the Taliban, AI-Shabaab and most recently ISIS, all of whom target American interests. Washington must realise that any arrangement made in defence of Africa must adhere strictly to UN security architecture, as well as to the principles and protocol laid down by AU and Sub-regional groupings. And for that matter, the US could do better by channelling her abundant recourses towards the development by means of funding, logistics and training of the AU-sponsored African Standby Force, in order, to make it active, operational and dependable.